Before I started OMAD, I had to think of why I was doing it. People saw benefits from eating once a day and I wanted to see results from it. 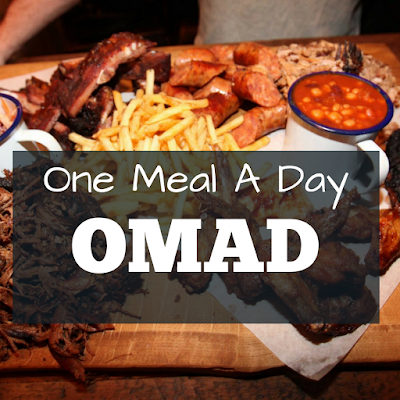 OMAD is a 23:1 Ratio, meaning you only eat ONCE Per day. There's countless of benefits or reasons why people eat once a day. Some reasons are health benefits, eating restrictions, dieting, improving body fat burn (FAT LOSS) and much more. I wanted to perform OMAD to see if thus was true. "There’s high level athletes like Rhonda Rousey, and Herschel Walker that has been eating this way for years. We eat a lot more than what we need in this country.. I’ve been training and eating this way for some time, and I promise, I feel so much better eating this way.. And my mind thinks a lot more clear." After couple of weeks eating once per day, I noticed changes, a lot of changes. My energy has increased, my body fat is reduced dramatically (I'm more leaner), I save money, I focus more on nutritional foods rather than eating junk foods with no nutrition value, it increased my discipline (a huge bonus), helped me stay on track with my diet and overall my health, skin, and mood has improved. Beforehand when I USE to eat junk food a lot, I noticed that I would feel groggy, less focused, mind is jogged, and somewhat depressed and no motivation what so ever. When I changed my eating habits, everything changed as I mentioned. BUT that's not due to OMAD, I just learned from when I was doing OMAD, from a healthy perspective, that nutrition is more important, quality is surely the key. The Key To A Healthy Living is moderation n the goal yo set yourself up for. OMAD was designed to help people restrict or change there habits and/or perspective on overall life. All diets has its purpose; All must be in control, consistent and done correctly. OMAD isn't the cure, some may be against it and have negative comments/info about it. Everyone has their opinions. OMAD Was A Good Experience but a long use of OMAD had me going nuts. I would be angry, easier to piss off, and my mood wasn't "Positive." It was probably due to me starving at times n letting it affect me but using coffee to suppress my appetite was always in my favor. It wasn't like this everyday though, just some days - You know, everyone has there days.. If you're wondering if I should EAT ONCE A DAY, think to yourself, is it useful? During the times of OMAD, I had to EAT A LOT to get enough Calories IN. Think about it, we people eat, Breakfast, Lunch and Dinner to reach our calorie goal (for those who tracks) to sufficiently build/maintain muscle and mass. If you don't reach your calorie goal, you'll be underfed. Being underfed will led to weight loss, muscle loss and more depressing symptoms. If you know how to track your meals, you can easily do OMAD or just eat til you're satisfied (not optimal). The health benefits are what people do it for mainly and I must say, my overall well-being feels much better but sometimes the hunger can get to me. KETO DIET - Effective Method For Fat Loss!